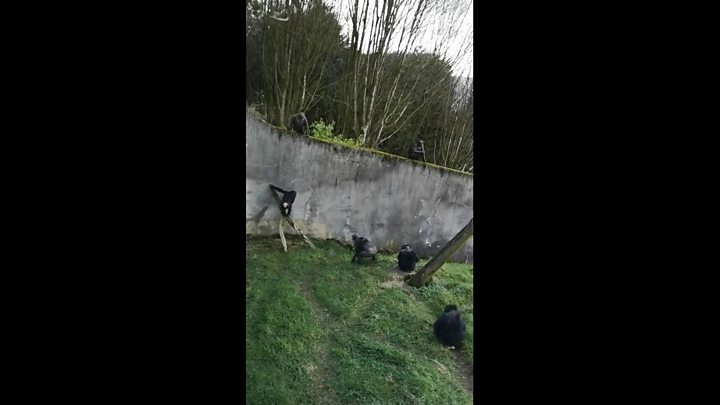 Visitor Danielle Monaghan, who shared video of the daring escape on Facebook, told the BBC she was "petrified" the chimp might "attack or take the kids". She wrote that one of the animals came close to her grandchildren, with "Belfast Zoo trying to make out it wasn't a big deal". However, the animal did not seem threatening, to Ms Monaghan's relief. She said she was "scared" but called it an "amazing" experience and said the chimp appeared to be "very calm". "We just walked past it and it was absolutely grand". "They're intelligent primates and know they're not supposed to be out of their enclosure, so got back in themselves", Mr Cairns told the BBC. The great escape ended when the animals returned to their quarters. Last month, an endangered red panda cub escaped from Belfast Zoo.It was eventually found in a residential garden a short distance from the zoo. A zoo spokesperson told media that the chimpanzees were only briefly out of their enclosures as zoo personnel were on hand to return them.